Practice management solutions for keeping your practice as healthy as your patients. Your veterinary practice is a place where patients get the exceptional care they need and clients leave happy. What if your practice could also be a place where team members love coming to work in the morning, support and encourage each other, and are actively engaged in helping the practice grow? In this podcast, leadership consultant Randy Hall shares tools and strategies for building the kind of culture you’ve always wanted for your practice. He covers topics like attracting and hiring all-star employees, leading a fully engaged team, minimizing practice conflict, developing leaders on your team, and more. You’ll learn practical solutions for the biggest management and leadership challenges in veterinary medicine so you can start creating the practice you’ve been dreaming of. Learn how compensation is a huge component of how your employees assess their value in your practice. Find out the 3 key guidelines that will help you figure out your most effective compensation strategy and how to build the one that is best for your practice. Join Randy Hall as he explains the critical importance of choosing guiding principles that you think are best and then developing the habits that help you execute them in your practice. Find out why you have to pick your beliefs with purpose and why you can’t just let them evolve. In this podcast episode, Randy Hall shares four ways team huddles can benefit your practice, dispels myths about why huddles might not work in a hospital, and offers questions to help your team get the most out of each huddle. Find out how to get team buy-in for forward booking, but also see how this approach is universal for any behavior change you want to achieve in your practice. In this podcast episode, Randy Hall shares eight reasons why your hiring process selects the wrong people and offers advice for making big changes to the way you hire new talent. What sets great leaders apart from others? What can leaders do to take their veterinary practice to the next level? In this episode, leadership consultant Randy Hall shares 5 things that represent great practice or team leadership. In this episode, Randy Hall provides practical, ready-to-implement ideas that will help your new employees avoid the “loneliness trap” and become fully engaged and integrated members of your team. You will learn three essential steps to develop an onboarding process that starts your new hires off right and sets them up to contribute to your practice’s future. If you want to change the behavior of your team, start by thinking about how you can change your own behavior first. In this podcast episode, Randy Hall shares an example of how one leader made a simple change in behavior and saw incredible changes in the attitude, engagement, and success of his team. If you want a productive practice team, you need to give and get feedback often. Most leaders think they deliver it well and regularly, but chances are, they don’t. In this episode, Randy Hall explains the top 3 reasons why you are likely not sharing feedback as well as you could, and the top 3 ways you can do it better! There are 3 key leadership habits that can build a strong practice culture, keep healthcare teams fully engaged, and support the hiring and development of great talent in your veterinary practice. Do you have them? Did you ever think your practice policy on cellphone use could be getting in the way of creating a great hospital culture? Listen as Randy Hall discusses one of the biggest challenges with clinic policies—they are usually built for the few staff members that aren’t at their best, and not for the ones who are trying to be their best. Your veterinary practice’s success hinges on having a clear vision. In fact, it’s absolutely crucial to what the future of your practice looks like. Leadership consultant and Aspire founder Randy Hall explains why a vision statement is vital to your clinic’s medical and business growth. Having trouble finding the right people for your team? In this episode, Randy Hall provides tips and strategies for attracting the best talent to take your practice to the next level. In this episode, Randy Hall talks with Veterinary Practice Lender and DVM, Dr. Brennan Pitard, from First Financial Bank. 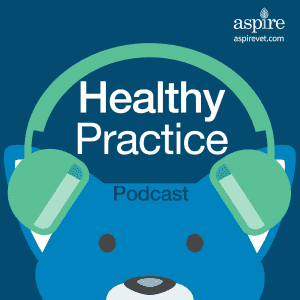 Listen as he shares information on the finances behind practice ownership and offers advice for handling common veterinary financial challenges. In this episode, Randy Hall chats with Dr. Wendy McGuire of Fischer Veterinary Clinic. Dr. McGuire shares her experience developing a collaborative vision with her team and how that vision is causing positive changes in her practice. In this episode, Randy Hall sits down with Dr. Julie Reck, the owner and founder of Veterinary Medical Center of Fort Mill in South Carolina. Dr. Reck shares her experience implementing the concepts and ideas of Aspire and how Aspire has helped change the culture of her practice. Find us on your favorite podcast app!